It’s obvious. Any online marketer would wish to rank on #1 position in search engine ranking page. It makes sense. Because the click-through rate for the 1st position will be much than for the page that lies in 2nd position. Even the 2nd position is closest to the top. Then think about it, how hard-hitting it will be actually to get that top ranking? There are a lot of factors that impact and gets you high SERP ranking. Domain Authority is one among such factors. DA is the ranking metric to predict how strong a site will rank. It is developed by one of the top players in the SEO industry, MOZ. MOZ rates DA out of 100. There is no threshold on DA score. Higher the score, the site will rank higher. Of course, the low DA sites can incur traffic losses and ranking. It is evident that we have to do something to improve such DA rank metrics. However, increasing DA score is not so simple to happen straight away. Also, make a note that boosting DA score from 20 to 30 is somehow easier than improving from 70 to 80. Meanwhile, you cannot play around any shortcuts or performing one or two changes on your site to boost the domain authority. Indeed, you can employ the below methods to increase domain authority of your website quickly. MOZ has its own tool to check your DA, called Open Site Explorer (OSE). Visit the web page and simply enter the URL in the search bar and see the authority results. Don’t get disheartened if your DA is low. There are techniques to bring it up. MOZ has its official page to talk more about domain authority. MOZ was stating that DA depends on data from Mozscape Web Index and it also includes other MOZ metrics say Page Authority, MOZ Rank, MOZ Trust Score, etc. Don’t isolate DA; it is a part of your comprehensive SEO strategy. Improvement in your DA is a sign of best SEO practice. With all this in mind, let’s start exploring some different ways to increase domain authority of a website. MOZ explains you have to crack down your overall SEO to improve domain authority. Attend to all your on-page and off-page technical SEO factors. There are no strict rules to work on specific SEO factors that will boost your domain authority. In general, you have to meet all your technical SEO aspects. The typical SEO factors – Meta Tags, Mobile rendering, sitemap, robots.txt, site loading speed, quick navigation, proper URL structure, domain name, header counts, keyword density, heading tags, alt tags, image optimization, and so on. Among all, Meta tags are crucial as it enables search engines and readers to access your page quicker and easier with higher relevancy. This, in turn, results in boosting SERP. If both search engines and people can crawl your site easier than others, it literally means that your DA will go up. The second key aspect is mobile responsiveness. As the Google search ratio through mobile devices is at a higher range than desktops, you will have to pay extra attention to your mobile suitability. Build up your site with responsive design and optimize it separately for mobiles suits. Similar to general SEO, Mobile SEO is not just to be carefree. Even, I would suggest having keyword research for mobile compatibility to ensure your site is most approachable through mobile devices. Till now if you have not separately worked on your site for desktop and mobile, you have to do it right now. Check your site’s mobile-friendliness and take necessary actions to see a significant impact on your increase in domain authority. Along with these make sure to fulfil all your technical SEO. Without such necessary enhancements, you cannot step ahead to improve your DA. There are plenty of practical link building techniques available. You can end up your link building process with any of such backlink generating methods. Before everything, you have to have excellent content that grabs user’s attention. Here comes the term, Content. SEO-friendly content writing refers to creating content that meets your user’s needs. Content marketing is crucial to have a grand link building strategy. High authority domains or sites links to your page boosts your domain authority. Your content has to be more appealing to attract quality and authoritative backlinks. Once you are producing amazing content that worth linking to, then content marketing is your further action. You can use forum or Q&A sites as excellent sources for content marketing as well to acquire links to your pages. In like manner, Quora is a unique platform for both. Search for your niche related questions and actively participate in answering your thoughts. Meanwhile, you can place your links wherever necessary. Don’t contribute for the sake of putting links. Assist others with your informative answers; get flavors as a token of thanking. But, don’t be intentional. By the way, I don’t encourage the practice of buying backlinks, where your DA isn’t increasing. It is an upfront truth that if your website is capable of serving both search engines and users effectively, then doesn’t bother about DA. Entertain techniques to feed what SE’s and users want; it is the core of domain authority improvement efforts. Such a tactic is, internal linking. Structured site architecture with proper internal linking strategy builds a power network within your site. Organized internal linking makes your readers as well as search engines to crawl your pages and navigate through easily. If you are struggling to reduce your site’s bounce rate or dwell time, then you might not have interlinked your pages appropriately. Linking to old blog posts make your recent posts more informative and attention-grabbing. Make sure; you don’t fail to check the relevancy of the pages you are linking internally. I don’t suggest always using keywords or tedious anchor texts for placing links. Make it happen naturally. I will have to share a clip here. Implementing Silo structure is an ever recommended way to improve your internal linking structure. More internal links you generate will make your site denser with information appealing readers to visit your website and stay tuned. Along with domain authority, MOZ has multiple metrics to rate your website and particular web pages. It includes page authority, Trust Score, Link Profile and so on. If you want to see a major increase in your domain authority, you have to check your link profile. Link profile simply refers to all your backlinks that your pages acquired. Google loves link profile that is both authoritative and healthy. Here, authoritative applies to high authority pages links to your domain. On the other hand, healthy backlinks refer to links that stay in line with Google guidelines. The link profile is a critical aspect that determines your trust score. Frequently, perform link audit to know the current link profile. You can use tools like SEMRush, MajesticSEO, ahrefs, MOZ to ensure that you are employing apt link building technique. Thankfully, there are much greater techniques available to have organic backlinks. Those techniques are safer too. Guest posting gives you hands in an effective way to get featured on popular sites. Continue reading to know the complete process of improving your link profile that literally relates your domain authority. If you are more serious about bringing up your backlinks numbers, you might try various link building methods. But make sure that you are on the right track. Because there link strategies that may lead to spam or unhealthy links that ruin your authority. Moreover, your site will get penalized violating Google guidelines. Such type of link building is called link schemes. I understand any site will have few links that belong to link schemes. No website can be that perfect. As you wanted to see an increase in your domain authority, then you will have to reduce the number of such bad links. It’s fantastic if you could get rid of almost all unhealthy or bad links, its great then. I could see most of the webmasters won’t be serious about disavowing bad links unless or until Google penalizes for it. Why wait till penalty hits? Have a regular practice to eradicate spam links that impact your site authority. Clean up your link profile regularly else you cannot even gain the actual benefits out of content marketing too. I strongly suggest you build healthy links while generating new links itself. Then why you have to ditch your time to disavow the spam links. You can free from headaches. If you don’t have, then your domain authority will remain low. There is no documented proof that any site or page that claims higher social signals will have higher DA and better SERP. However, you could have a strong correlation between the top ranking pages and its social signals. Almost all the social media sites will have higher DA. By way of sharing your content and linking your page on such high DA sites will have an immense effect. Amazing content will go viral with no time, getting more social shares. You don’t leave even a single fruit that even renders minimum juice out of it. So, I would suggest you reap the benefits utmost what you can get from social media platforms. Entice your social media profiles, grow your followers and build a network. Make sure you are having an active presence in social networks and strongly connected with influencers. Don’t ever forget to have social share floating buttons on the homepage to enable your readers to share your content with easy clicks. By branding or building, reputation may not directly boost your DA or SERP ranking. However, becoming an authority leads to gain quality backlinks. Working strategically and systematically on above said things would give rise to your domain authority. I don’t say, no. However, as mentioned earlier it won’t happen overnight. You have to be patiently waiting to attempt all effective ways to boost your SERP rankings. It will automatically lead to the increase in DA. Another less common factor or people usually forget to take into account is Domain age. However, domain age doesn’t directly means domain authority. In general, older the domain will have higher DA. Similarly, new websites or young domains will have low DA. Even older domains might have low DA as if it has no updates for a long time, under outdated SEO practices, penalized frequently and so on. In short, you will have to work towards improving your website rankings seriously. 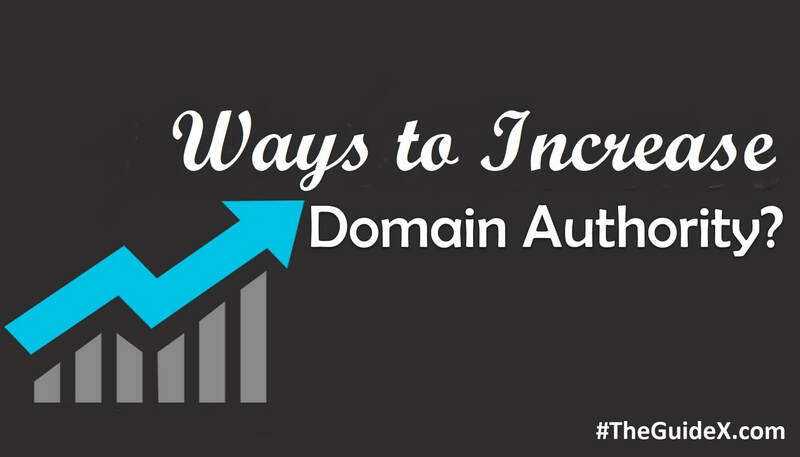 In turn, you can see your domain authority is getting growing. I would say, you will have to wait for the outcomes. To conclude, you might have come across loads of web pages crunching ideas to increase domain authority of your website. You might be missing some crucial points what I have shared in this article. Simple by tweaking this and that may lead to confusion. To make you clear, look at the big deciding factor – Content. You can achieve great success in other areas like link building, SERP ranking, and traffic generation, only by having amazing content in place. Having better content strategy with higher publishing frequency targeting links from trustable sites, you can improve your domain authority. Everything else will sit in better place assisting you to achieve your goals. It is nothing but rising in domain authority and 1st position in SERP. I hope you to include your focus on high DA in your long-term SEO strategy. Don’t work on it isolating. Glad to see your presence here and sharing your idea about guest posting. Thanks for everything. Thanks for reading this post and marking your valuable comments. Thanks for spending your valuable time on reading this page about ways to improve Domain Authority. Stay tuned for more informative articles. valuable post you wrote, lots of learning point you mentioned that is helpful to understand more. thanks for sharing the post. Happy to note that you could gain something out of this article on effective ways to increase domain authority. Everyone should be eager to improve their blog or website authority anyways. Thanks for visiting and reading this page to know ways to improve your DA. Hope it would be more helpful to you in a way or two. Great post. After reading this post I apply all this methods to increase my website DA. Great post on tips to improve domain authority. Normally, we will forget the last statement #7, expecting the results within no time. You have pointed great thoughts when we concern about gaining authority.